Replenish your sense of health and self with some nurturing and nourishing movement. This Restorative Yoga class will take you through a deep relaxing range of Somatic Yoga exercises, specifically designed to help you to wind down and replenish your body, mind and soul. The class will include a meditation practice, pranayama (breathing) techniques, and gentle mobility and flexibility exercises through Somatic Movement. The restorative benefits of the class will be enhanced with the use of relevant doTERRA pure natural therapeutic grade Essential Oils. The hips can hold a large proportion of your physical and emotional tension. By moving into and around the hips, you can create a feeling of relief, leaving you feeling relaxed, revived and renewed. This Yin Yang Yoga style workshop will gently energise the body and then soften through slow movement and held postures to mobilise and open the hips with the accompaniment of doTERRA Pure Therapeutic Grade Essential Oils. Grapefruit to encourage a release of toxins, Rosemary to dispel negativity and Myrrh to replenish the body and the mind. This Yoga Workshop with Jeni will focus on mobilising, strengthening and finding space around the chest, shoulders and neck with the accompaniment of relevant delicious doTERRA Essential Oils including heart-soothing Rose, calming Lavender and detoxifying Wild Orange. Replenish your sense of health and self with some nurturing and nourishing movement. This Restorative Yoga class will bring together aromatherapy, sound and light psychology, gentle freeing movement, blissful restorative yoga, and a respectable dose of chocolate. Practicing Pratyahara - withdrawal of the senses: in this workshop we will begin with Pranayama (breathing exercises) and Meditation to start to bring the focus inwards. We will then use blindfolds for the Asana (physical postures) practice. Suitable for all ability levels. Replenish your sense of health and self with some nurturing and nourishing movement. This Restorative Aroma Yoga class will take you through a deep relaxing range of Somatic Yoga exercises, specifically designed to help you to wind down and replenish your body, mind and soul. The class will include a meditation practice, pranayama (breathing) techniques, and gentle mobility and flexibility exercises through Somatic Movement. The restorative benefits of the class will be enhanced with the use of relevant doTERRA pure natural therapeutic grade Essential Oils. This 6-week course will focus on restorative Gentle Somatic Yoga to reduce stress and tension around the neck, shoulders and upper back. Working with Hanna Somatic techniques and some gentle yoga techniques we will combat these areas to teach you how to find wider range of movement, more stability in the joints and more awareness and control of movement. Over the course of 6 weeks we will work through deep restorative Gentle Somatic Yoga flows and exercises to reduce stress and tension in the body and the mind. This series of classes will leave you feeling relaxed and restored whilst also engaging your body and mind on a very physical and connected level. At this workshop we will work through deep restorative Gentle Somatic Yoga flows and exercises to reduce stress and tension across the back. This 6-week course will explore Gentle Somatic Yoga techniques as we focus on the "core"; how to really feel and move from the centre of the body and how to release tension and muscular discomfort in the whole body from by working from the core, out. This workshop will focus on restorative Gentle Somatic Yoga to reduce stress and tension around the neck, shoulders and upper back. Working with Hanna Somatic techniques and some gentle yoga techniques we will combat these areas to teach you how to find wider range of movement, more stability in the joints and more awareness and control of movement. Spend 6 weeks opening up the hips, loosening the hamstrings and finding length and strength in your lower limbs. This is an ideal series of classes for runners, cyclists and those who want to get the legs moving. Focusing on the lower limbs we will be using Gentle Somatic Yoga to reduce stress and tension and find greater mobility and flexibility. In this creative AROMA YOGA workshop we will celebrate and honour the upcoming Equinox, the moment of balance when day is equal hours to night. We will then discuss what the Equinox means and look, reterospectively at the past 3 months of Summer post-Solstice. We will think about this period in light of the Eclipses, what this has meant for each of us personally, how to integrate these experiences in to our present understanding, and set seeds of intention for what we want to do with this knowledge for the future. You will have the opportunity to better understand and communicate with the natural rythms of the year, through meditation, physical yoga practice, contemplation and discussion and, of course, with the assistance of powerful and enriching doTERRA Essential Oils. Backbends are invigorating and strengthening and they can help with good posture and alignment of the spine. For most people, our physical response to stress is to curl in - to round the shoulders and protect the front of the physical and energetic heart centre. Due to this reflex, we find backbending challenging - it takes courage to "open up" but this action also invokes courage! In this AROMA YOGA workshop I invite you to explore what is required to safely and courageously extend into backbends and to explore the mobility in your back. Time for twisting and cleansing as we welcome the start of Spring and all the bright new vitality that this season brings. This workshop will boost your energy and leave you feeling like you have given yourself a thorough Spring Clean! This Restorative Yoga class will take you through a deep relaxing range of Somatic Yoga exercises, specifically designed to help you to wind down and replenish your body, mind and soul. The class will include a meditation practice, pranayama (breathing) techniques, and gentle mobility and flexibility exercises through Somatic Movement. The restorative benefits of the class will be enhanced with the use of relevant doTERRA pure natural therapeutic grade Essential Oils. This Yoga Workshop with Jeni will focus on the strength and mobility required to play with inverted Asana - positions that find us upside-down. With the accompaniment of relevant delicious doTERRA Essential Oils including strengthening and centreing Frankincense and enlivening Peppermint. 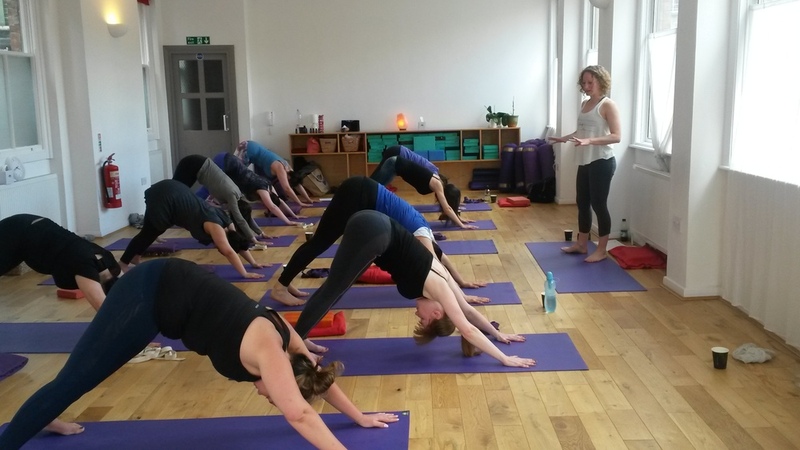 This Yoga Workshop with Jeni will focus on mobilising, strengthening and finding space around the chest, shoulders and neck with the accompaniment of relevant delicious doTERRA Essential Oils including invigorating Ginger, calming Lavender and detoxifying Wild Orange. This Workshop will focus on elements related to the Base Chakra - stability, core strength, balance, stillness, connection to the body and to the earth - with the accompaniment of relevant delicious doTERRA Essential Oils.